I recently joined Birchbox and will be blogging about each monthly shipment I receive. 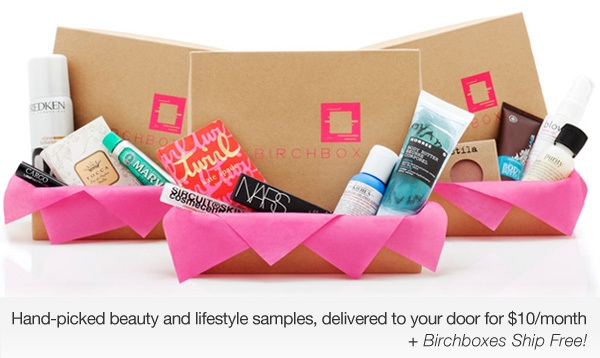 Birchbox lets you sample the latest beauty and skincare products by delivering a box full of samples to your doorstep for only $10 a month! You fill out a questionnaire upon signing up so each month your box is personalized to your preferences, skin tone, etc. Each month also has a different theme and the items inside are associated with that theme. 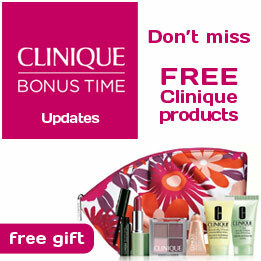 They work with all the top brands like NARS, Khiel’s, Stila, Fresh, Essie and many more. You can check out their list of brands here. They also have a rewards system so that when you buy full-sized products from their site you accumulate points you can put toward items. Birchbox has a waiting list so once you request a membership you wait until it’s your turn. I waited about two weeks for my invitation. Here is my review on the June Birchbox! 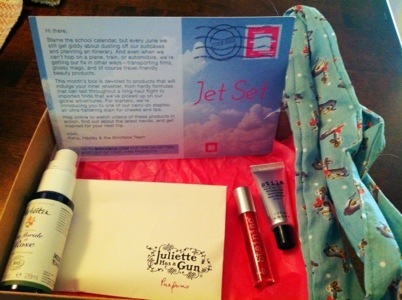 June’s Birchbox is a Jet Set theme, so it’s full of items that are travel-friendly and serve multiple purposes. A single-element fragrance by Romano Ricci. It’s made with Ambroxan, which is a synthetic substitute for grey amber and often used as a back note in perfumes. Juliette Has A Gun is described as “minimalist, elegant, pure.” It’s also allergen-free. This is a very unique, clean, feminine scent. I like that it’s made with just one element. I’d imagine this would help minimize perfume-induced headaches, which I definitely get with some brands. I don’t see myself buying a full bottle but I do enjoy the fragrance. A facial toner made primarily of water and organic rose petals. It’s meant to hydrate, refresh and tone skin. It’s made specifically for sensitive or prematurely aging skin. I absolutely love facial mists and really like this one. My skin feels instantly refreshed and hydrated after a spritz of this and it has a very strong rose scent. They also make lavender and orange blossom floral waters. I would definitely purchase a full bottle of this product. I’d prefer it in lavender since I don’t love rose-scented things. A 4-in-1 product that serves as a primer, moisturizer, anti-aging serum and sheer foundation all in one. It’s full of peptides to minimize appearance of wrinkles and antioxidants to protect against free radical damage. I’ve been really curious about beauty balms and was excited to try this. I really like Stila products and this did not disappoint. It provides a bit more coverage than the tinted moisturizer I typically use. It has a really luxurious feel as it goes on and it absorbs flawlessly into skin. It has a nice, fresh scent to it as well. I’m totally obsessed with my Laura Mercier but I would buy a full bottle of this product. The only downside is it doesn’t have any SPF in it. 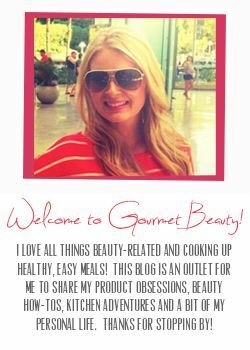 My fabulous beauty-blogging cousin gives more details on beauty balms here. A 2-in-1 lip and cheek stain in a bright pinkish red shade. It has a gel consistency and it’s very long-wearing. I’m a fan of the Benefit Benetint Rose stain and this gives similar color pay-off. The consistency is completely different, though. I like the gel consistency of this better. The Benefit stain gives a runny application and the gel formula of the Balm’s product makes application a breeze. Beauty Queen is described as a magenta-toned pink but I think it looks more red, like Benefit’s product. It makes lips look naturally but noticeably rosy. It also gives a gorgeous natural-looking flush to the cheeks. It doesn’t have a scent, which I also like. I would definitely purchase a full-sized tube of this. They make it in 2 other shades; Prom Queen-a rose pink, and Homecoming Queen-peach. A retro-inspired headband with flexible metal wire. I can honestly say I would not be caught dead in this headband. It’s just not my style at all. The one I received has a deer print on it, which I really don’t like, but the overall retro-style just isn’t me. It could look really cute on someone else with the right clothing.